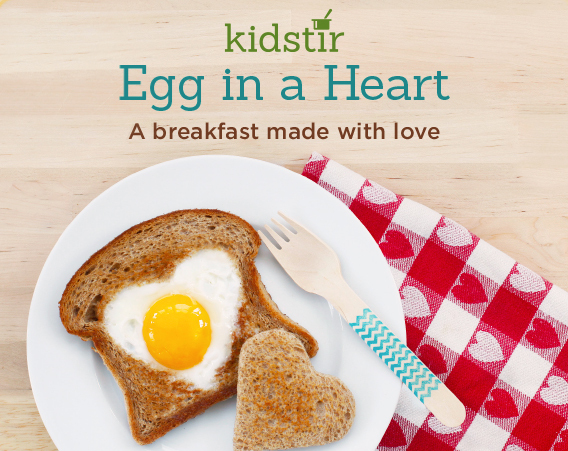 Surprise your family with a fun weekend breakfast: an egg in a hole. This twist on the classic is made with a heart-shaped cookie cutter. Enjoying this protein-packed breakfast together is a sweet way to start your day! 1. Place the bread on a cutting board. Cut out a heart shape using a cookie cutter. 2. Melt the butter in a frying pan over medium heat. 3. Place the bread and the heart shape piece of bread into the frying pan and toast lightly for a few minutes. 4. Flip the bread, then carefully crack the egg into the center. Flip the heart shape piece of bread, too, so it toasts on the other side. 5. Cover the pan and cook the egg for a few minutes, or until it's cooked to your liking. Transfer to a plate and serve with salt and pepper.